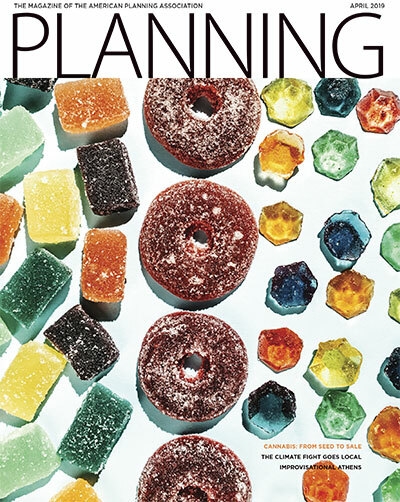 Eleven times a year, thousands of readers — planners and the public alike — turn to the latest Planning magazine. Each new issue is full of innovative ideas that are reshaping communities across America and around the world. California, an early adopter of legalized marijuana, has adopted progressive approaches that keep it in the lead among like-minded states. Find out what's happening, weed-wise, in the Golden State and Colorado, in the April issue of Planning. Plus, learn how states are addressing climate change as federal action stalls. Then take a quick trip to Athens, where entrepreneurs are revitalizing a neighborhood pummeled by years of austerity. Even as more states legalize marijuana, California's progressive approach continues to lead the pack. Juell Stewart catches up with planners making the industry work for their communities. Plus: A Cannabis History, Planning and Policy Lessons from Colorado, Can Cannabis Policies Catch Up? Planner Michael Kavalar visits post-austerity Greece, where urban entrepreneurs are stitching together a frayed Athens neighborhood, one community-driven shop at a time. A guest column by Ann Forsyth, the new editor of the Journal of the American Planning Association. Pints with Planners, new hazards research, Women and Planning Division turns 40. Urban opioid use, Boston's seawalls. Government shutdown, Amazon ousted, landmark discriminatory housing case settled. Piecing together the preemption puzzle. Timothy Beatley checks in on negative emissions as a climate change remedy. Advancing equity, public housing, tax increment financing. Bay Area planning exhibits, Balloonfest, The Fight to Reduce Homelessness. Cover: Cannabis-infused edibles — sour gummies, raspberry fruit rings, and jewels. Photo by Benjamin Rasmussen/Getty Images.